About Me and What are Sundrops, Anyway? The friend I was expecting today actually came yesterday (Saturday), so here I am on Sunday instead. That's kind of how life goes around here. So, on to half-square triangles, or HSTs as they're commonly called nowadays. 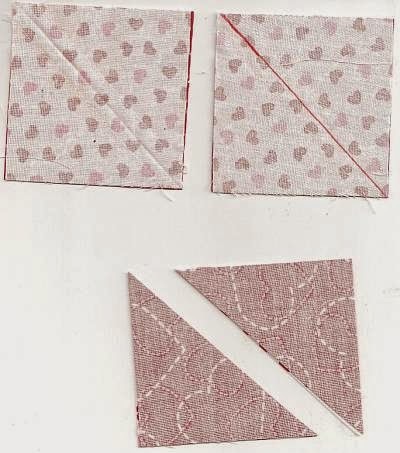 Simply, these are made by cutting two squares of fabrics A and B in half diagonally and then sewing the resulting triangles back together, pairing a fabric A with a fabric B. It's one of the simplest and most basic units of patchwork, but there are at least half a dozen ways to make them. I'm only going to cover a few of them here. For this project, I started with 3-inch squares of light and dark fabrics. In the first method (top left in photo above), I folded the light square in half to make a creased line, placed the light square right sides together (RST) on the dark square, then sewed 1/4-inch from each side of the creased fold line. 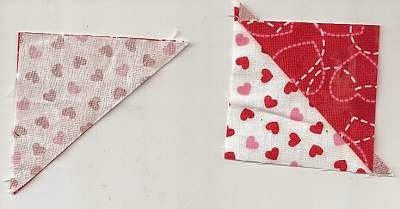 The squares are then cut on the creased fold line, creating two HSTs. This method is simple and low-tech, but requires good lighting and good eyesight. At my age, my near vision isn't as good as it use to be, and the lighting in my shed studio after dark is pretty minimal. I generally avoid this method now, but used it a lot years ago. The second method (pictured top right) is very similar: the creased fold line is simply replaced by a pencil or pen line drawn with a ruler. This method is a bit more time-consuming, but the line is a lot easier to see! I used this method for years, starting with pencil lines at first, then later using fine-point, washable felt markers. I'm not getting any younger, have made me brave enough use this method again. Whatever the method, once the triangles are sewn together each HST unit must be pressed open. In most cases, place the dark fabric on top and then flip it over and press. This presses the seam toward the darker fabric and reduces the chances of it showing through. In some block patterns, the seams need to be pressed toward the light fabric in order to make all seams nest together later. In the "Sunrise, Sunset" block, all HST seams can be pressed toward the dark fabric. Once the HST units are all pressed, it's time to trim them to exact size. In this project, they have to be trimmed to 2.5" square. There are all kinds of rulers on the market for doing this, and slightly different instructions to go with each ruler. If you need help with this part, I suggest checking youtube.com for a video that highlights your kind of ruler. 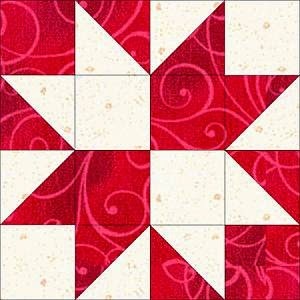 I still use my 5" x 18" ruler to do this part -- I haven't seen any quilter on tv do it this way since the 90's! Last week didn't go as planned. Too many times getting in and out of a car caused my hip bursitis to flair up, so I had to slow down, sit in overstuffed chairs and work on my knitting and crochet projects. I have a redwork project in progress, too, but it got put away somewhere last fall and I haven't seen it since. Someday, I'll find it. This week, my internet speed has been crawling even more slowly than usual. It's so frustrating that I don't even want to try going online most of the time. There has to be a solution to this other than moving to the asphalt jungle. Someday, I'll find it, too. Meanwhile, I'm slowly progressing on my stack of half-square triangle (HST) units. Trimming them all to the proper size is not my favorite part of the quilt-making process, but I've had little success with the method of cutting the triangles to exact size first then sewing them together -- I end up with too many HSTs that are too small and then I have to cut more triangles and sew more HSTs. So, I stick with the more time-consuming method of cutting larger triangles, sewing them together, then trimming them to size. In the long run, I actually save time and fabric! I'm hoping to get back online tomorrow to post instructions for HSTs, but Saturdays can be a bit tricky to predict -- too many unexpected things happen on Saturdays. I got my fabrics all cut out! My dark fabric was my smallest piece of yardage. If I make no mistakes along the way, I have just enough squares to make 12 blocks. I''m currently leaning toward using nine blocks for a wall hanging and three blocks for a small table runner, but that may change along the way. Next step: making half-square triangle units! Quilt-Along Images: Will They Upload? I'm trying this again with a different web browser and with smaller images -- wish me luck! Eureka! We're getting somewhere! 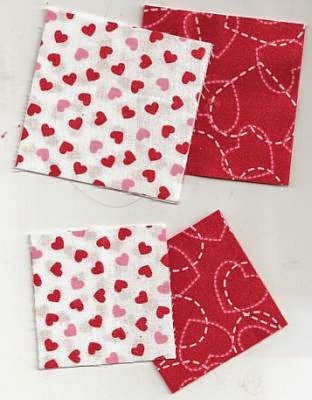 These are the two heart fabrics that I'm using. Below is the "Sunrise, Sunset" block that I've chosen. It might be known by half a dozen other names, too -- I haven't looked it up yet in Barbara Brackman's reference book. And here are a few alternate colorations of this block. It's a two-color, positive/negative block, so just about the sky's the limit with color and print options. I'm making 8-inch finished size blocks and can get 9, maybe 12 blocks from my less-than-one-yard fabric pieces. Larger size blocks will require larger pieces of fabrics. Or this could make a nice scrappy project with lots of lights and darks of similar value. 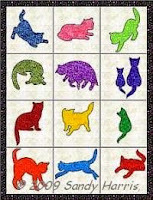 Does anyone besides me see kitty heads in most of these blocks? They seem so dominant to me that I've started thinking of the four quadrants as kitties - light and dark kitties. So don't be confused if I slip up sometime and call something the kitty unit! 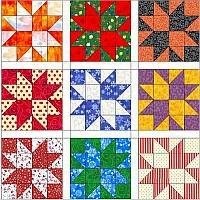 Here on the west side of Oregon, we get a lot of "liquid sunshine," so a few of my favorite things include "sundrops," kittens and anything arts & crafty, but especially quilting. 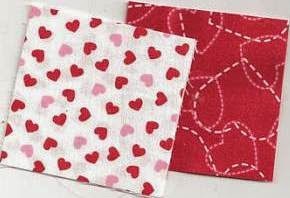 What is your preferred method for cutting fabric for quilting?